1. Blend butter and sugar until light and fluffy. Add eggs, one at a time, beating each one well. Add in syrup and vanilla. Combine the remaining ingredients and gradually add to the butter and sugar mixture and mix well. Cover and refrigerate for a couple hours or until easy to handle. 2. On a lightly floured table or cutting board, roll out to 1/8-in. thickness. 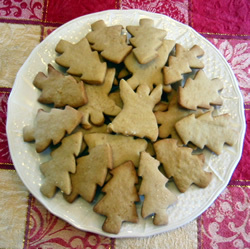 Cut with a floured cookie cutter. Place apart on ungreased baking sheets. 3. Bake at 350° F for 9-12 minutes or until golden brown. Remove and cool on wire racks. Makes about 4 dozen.